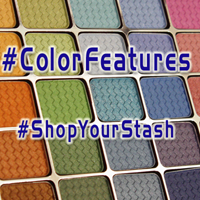 To date, I have not been a huge customer of Aromaleigh - largely because of how I got into mineral makeup, needing to use store-brands I could test first and then looking for lower prices, then slowly trying out this small merchant and that one. 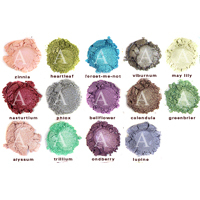 So while Aromaleigh v1’s been active for quite some time and I had visited their site, I didn’t really know anyone else who was using their products, I didn’t dig deeply enough to see the photos of proper swatches, I didn’t get involved in the community…I didn’t see anything that made me decide, “Yes - I’m going to try them out” until relatively recently. I initially got Mallow, Alyssum, Bellflower, and Zinnia from this collection during its first outing. Money was not flowing smoothly, so I was not able to place the additional order that I wanted. I did eventually get Trillium, Forget-me-not, and Viburnum at a later date (winter 2010, when the collection was made permanent) and was able to order Lupine and Phlox at my leisure; but I completely missed Candytuft (edit: I got it later, during the spring 2010 vault sale. Yay!) Mallow and Alyssum are so very, very similar that I wish I had only gotten one. They're like Beyond Skin Deep and Define Beauty from The SheSpace: both extremely similar, both softer near-neutrals, one slightly better for warm complexions with the other slightly better for cool complexions. I'm initially thinking that I'll use Alyssum more than Mallow...but, really, they are awfully close.